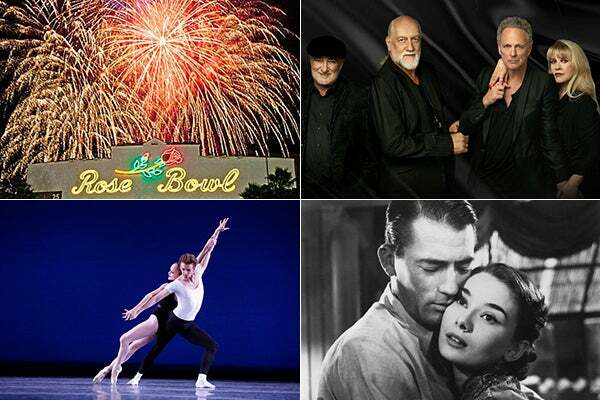 Photo (From Top Left, Clockwise): Via Rose Bowl, Fleetwood Mac, Cinespia, Los Angeles Ballet. While this week will inevitably be filled with fireworks, BBQs, and red, white and blue galore, the 4th isn't the only exciting thing happening in the next seven days. From ballet and photography to music and a movie, we've got a handful of awesome events to fill your calendar. And, of course, we threw in our pick for the best way to celebrate the holiday. Start clearing your plans. because you won't want to miss our rad recommendations. We’re not ones to get your hopes up with rumours just to let you down. That said, the legendary Fleetwood Mac is definitely performing at the Staples Center, and our Stevie Nicks lovin’ selves couldn’t be more pumped to jam with this Grammy-winning group. Excuse us, we need to craft the perfect pre-concert playlist (and outfit), stat. When: Wednesday, July 3, 8 p.m.
Where: Staples Center, 1111 South Figueroa Street (near West 11th Street); 213-742-7326. The Fourth of July can be a bit like New Year’s Eve — a lot of hype and floundered expectations. To make sure your Independence Day isn’t a dud, head to Americafest for musical performances from Mariachi Divas and Kenny G, motorcycle stunts, and, of course, a 30-minute fireworks show that’s the biggest in SoCal. Picnic outside the stadium or grab a bite and beer inside — either way, you best be in your finest red, white, and blue! When: Thursday, July 4, 2 p.m.
Where: Rose Bowl, 1001 Rose Bowl Drive (near Rosemont Avenue); 626-577-3101. Even in a time when every iPhone-wielding person thinks they're a photographer, true talent can still rise to the top. To witness shutterbugs with serious skills, head to drkrm's newest exhibition, Common Ground: New American Street Photography. The work of five accomplished, contemporary photogs will be on display, including Bryan Formhals, Richard Bram, and Chuck Patch. We have a feeling you'll find plenty of inspiration for your next Insta snap. When: Saturday, July 6 through Saturday, July 27; Open Wednesday through Saturday 12-6 p.m. and Sunday 12-4 p.m.
Where: drkrm, 933 Chung King Road (near West College Street); 213-928-0973. When: Saturday, July 6, 7:30 p.m.
Where: Grand Park, at North Grand Avenue and West 1st Street; 213-972-8080. Oh, Audrey. Whether she’s nibbling pastries outside Tiffany’s or gallivanting around Rome on a vespa, the style icon never fails to make us giggle and adoringly envy that effortless grace. That’s why we’re not missing the chance to catch Cinespia’s outdoor screening of Roman Holiday. Don’t forget to arrive early — so might as well bring booze, blankets, and a little chow for this fantastic flick! Where: Hollywood Forever Cemetery, 6000 Santa Monica Boulevard (at Gordon Street); 323-469-6349.